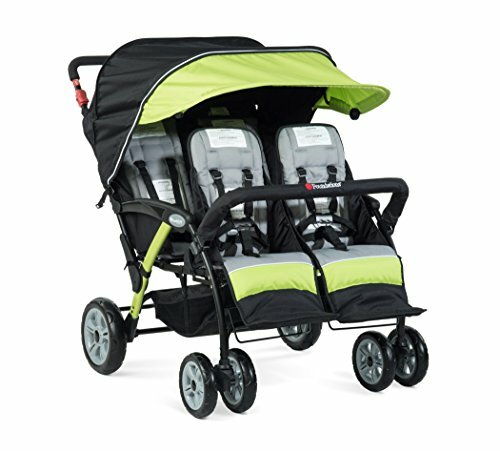 The Foundations Quad Sport 4-Passenger Stroller is one of the most popular multi-child strollers on the market, and features canopies for sun protection, easy to clean fabric, and extra-large storage baskets. All seats have adjustable 5-point harness, the ability to recline, and can accommodate children up to 40 lbs. Rubberized, shock absorbing foam wheels provide a comfortable ride. Stroller features in-line stadium design to maximize child visibility, to enable interaction with their environment and to ease maneuverability. Stroller features safe-break system which reacts when stroller handle is released. Stroller folds for convenient storage and transport. 1-year warranty.